I love April for a number of reasons... the days are noticeably longer, spring flowers are in their full glory, there's a hint of summer in the air.... AND we celebrate EARTH DAY on April 22nd! It's a great day to focus our attention on the environment and to think what we can do to reduce our "ecological footprint". In order to understand the importance of preserving and conserving, students need to understand the unique qualities and characteristics of Earth that make it habitable. Here's a fun and educational activity to get students thinking about Earth and what makes it stand out within our solar system. Students pretend to be aliens visiting from another planet (a great hook for students of almost any age!) and they must send back a report to their home about what makes Earth unique. It's a fun group activity that asks students to work collaboratively to come up with a Top 10 List. Click the image below to grab a FREE copy from my TpT Store. This is also a great activity at the start of a geography unit or science unit on biomes, landforms, or ecosystems. 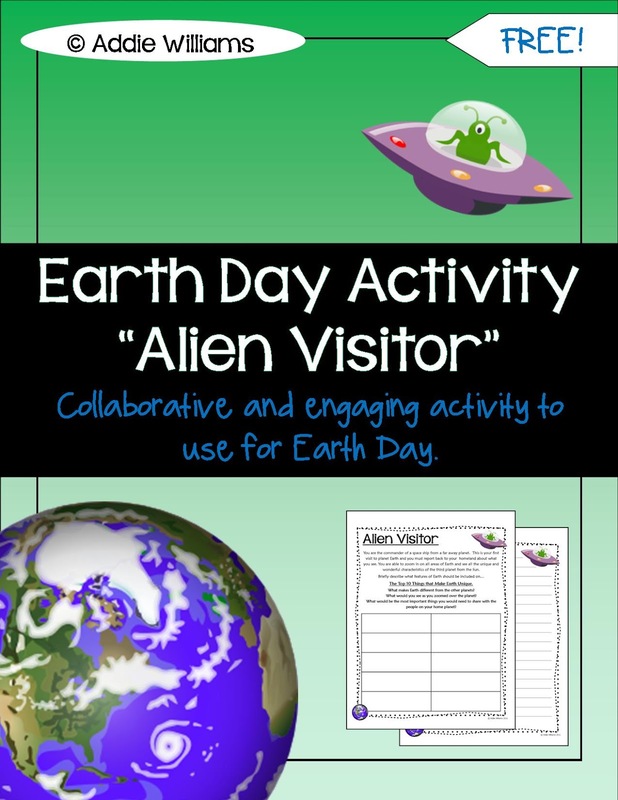 Here's another Earth Day Freebie available on my blog. Check out more April Freebies at The Cornerstone for Teachers - an amazing blog full of incredible classroom management and teaching tips. Too cute! I will definitely have my kids do this! We also have to teach about the planets! Thanks!!! I am excited to be your newest follower! Thanks Andrea! I really enjoy working on this with my students.